I’m back! It’s been a while! How are you?! I think this has probably been the longest pause since the Perky Pancake began. And I’m afraid there isn’t even a good excuse for it other than work trips, far too much eating out, and a lovely long holiday over Christmas. After 2 weeks of eating out in Sri Lanka over Christmas, some of which, it’s safe to say, was not exactly inspiring stuff, the cooking bug has struck me again and I’ve been beavering away in the kitchen since the start of the year. Sadly up to today though, laziness has also got the better of me and my camera has been firmly locked in it’s case. But all that is changing. I’ve got lots of delicious recipes to share with you and can’t wait to get going. 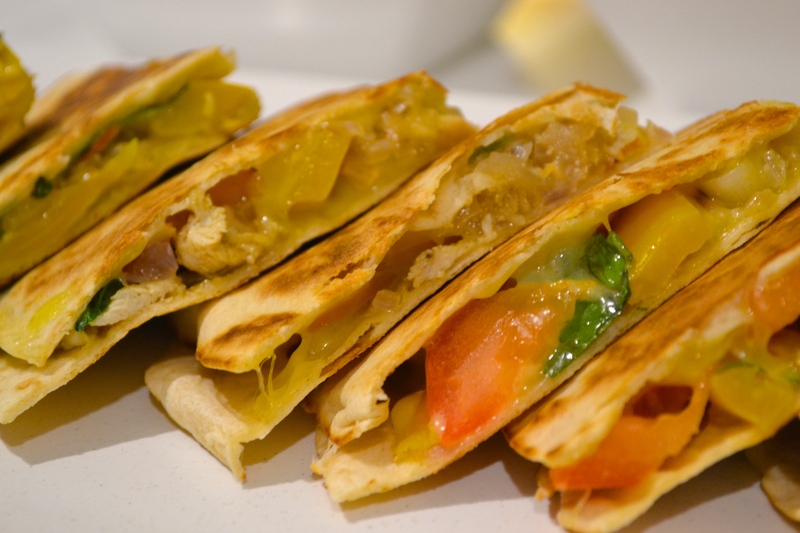 And where better to start than with some chicken quesadillas. 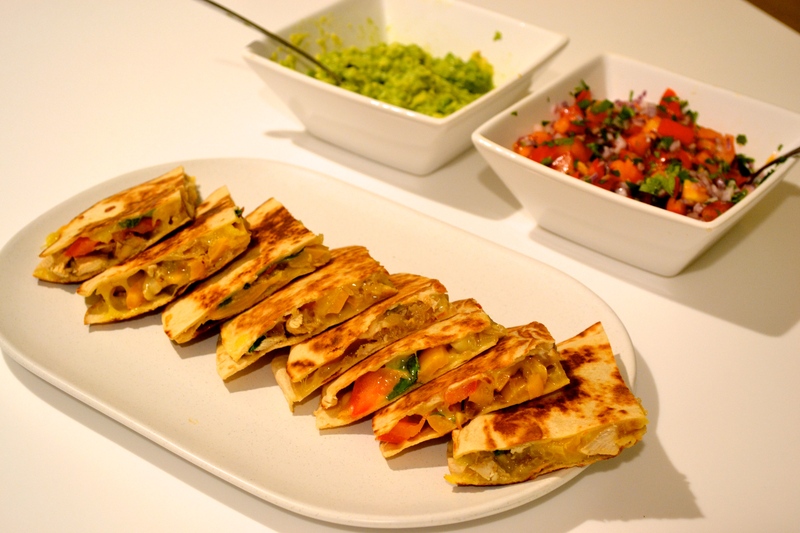 I would love to claim the credit for this recipe, however I was first introduced to the concept of the perfect quesadilla, smothered in guac and pico de gallo by a friend whilst on holiday in Costa Rica. He cooked up the most divine batch of these cheesy treats that any of us had ever had the pleasure of devouring. I don’t think he had an official recipe, so I’ve tried to copy his version. Sammy: I hope I’ve done them justice! They’re great mid-week fare as once you’ve cooked up your chicken, peppers and onions they’re pretty quick to bring together. The slower bit is making pico de gallo due to all of the tomato chopping, but you can easily buy that for a quick fix. They are also a fun meal to serve for groups of friends. Though if you’re the chef, be warned, you can only cook one at a time and they’re so much better fresh from the frying pan, so you might be stuck in the kitchen trying to keep up with demand! 1. Peel and stone the avocados and roughly mash using a fork. Stir through the lime juice. This can be made about 30 minutes in advance but any longer and it will lose it’s green colour and go a delightful greyish brown. 1. Mix all the ingredients together in a bowl with a pinch of salt. This can kept happily in the fridge overnight. 1. Heat the oil in a large frying pan (it needs to have a base at least as big as your tortillas) and add the onions and peppers. Cook over a medium heat for 5 minutes. Add the ground cumin and coriander together with the chicken and cook for 5 minutes or until the chicken is cooked through. 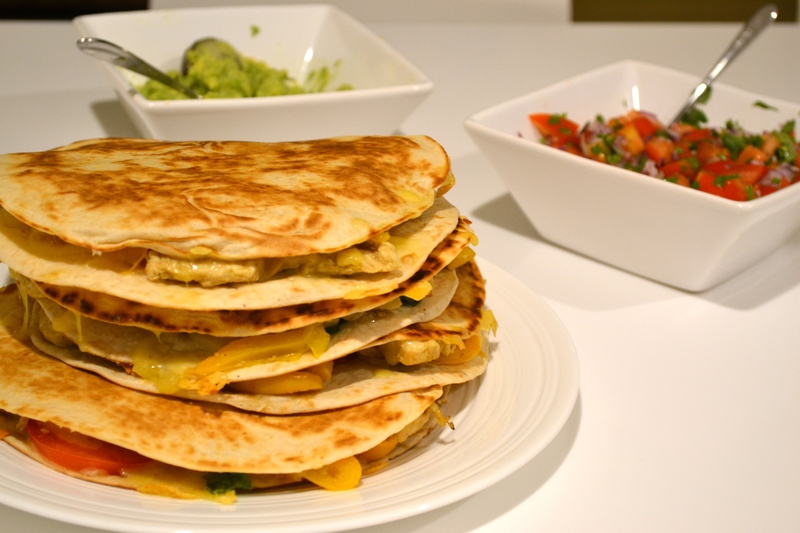 This stage can be done in advance, but just make sure you warm the mix through before you start to cook the quesadillas otherwise you’ll end up with cold filling. 2. Transfer the chicken mix to plate and wipe out the frying pan with a piece of kitchen roll. Turn on your oven to warm and put a plate in there. 3. Return your frying pan to the stove and heat over a low heat. 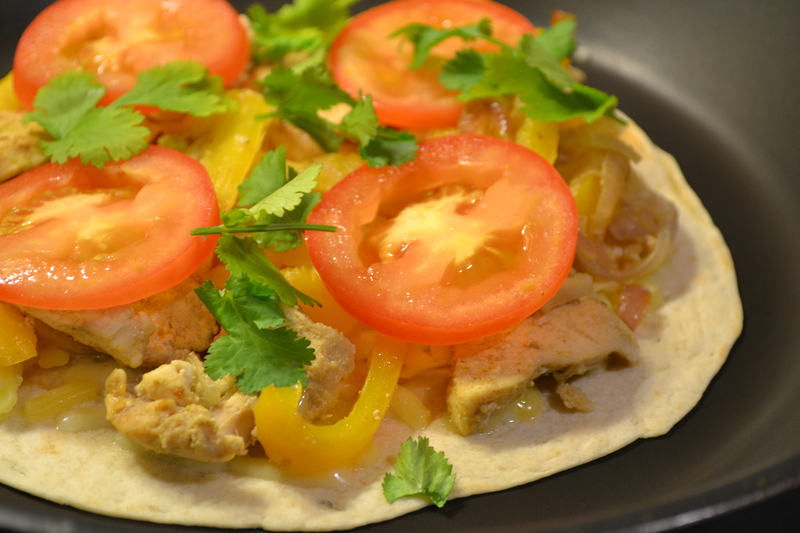 Place one tortilla in the bottom of the pan, sprinkle 1/8 of your cheese on, then pile on 1/4 of the chicken mix, 1/4 of the tomato slices, 1/4 of the coriander and then squeeze over one of the lime quarters. Sprinkle over another 1/8 of cheese, lay a tortilla on top then get ready to flip the quesadilla over. It will probably be ready to flip once you’ve done all of the above, however check to see that it’s golden underneath before flipping (usually about 1-2 mins). 4. I find the easiest way to flip the quesadilla is to place an upturned plate over the whole tortilla, put your hand over the plate then flip the frying pan and plate together so you end up with the quesadilla on the plate. Then you can gently slide it back into the frying pan to cook on the other side. 5. Cook for a further couple of minutes until crispy and golden on the bottom and the cheese oozing nicely. Transfer to the plate in the over and repeat the process 3 more times. 6. Cut into quarters/sixths and serve immediately with the pico and avo and perhaps a splodge of sour cream if you’re so inclined. Good alternatives to the chicken version include chorizo and potato – just replace the peppers, onions and chicken with a good helping of chorizo and cubed potatoes. So pleased the PP is back! I’ve missed you! Perky Pancake…I have missed you!!! 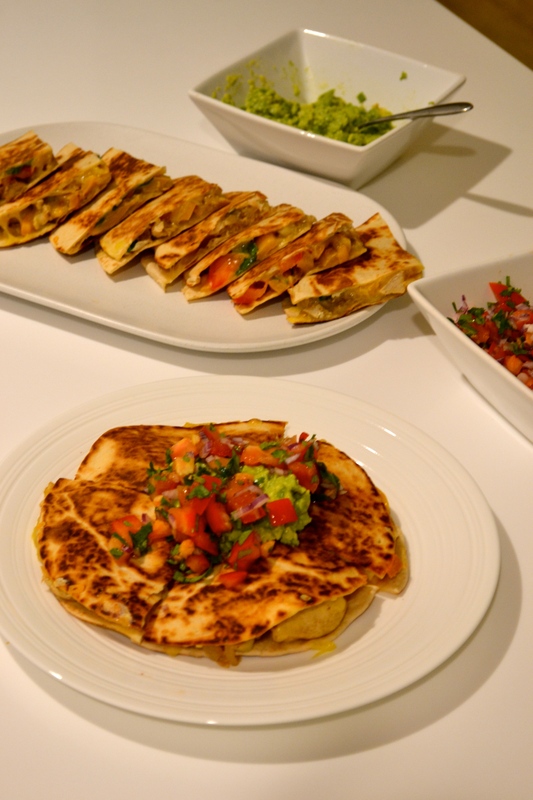 Could have done with this recipe on Wednesday when I made somewhat average quesadilla’s !! these look delicious though and I will be trying this out asap!! !